Grey bouclé wool peacoat from iconic German designer Karl Lagerfeld’s eponymous fashion label. Crafted from a textured mélange of Italian virgin wool, the coat comprises a lapel collar, a double breasted four button closure and a straight hem. Contrast leather cuffs and a detachable panel with a gunmetal-toned zip fastening also feature, adding a distinctive edge to the classic style. Complete with side slip pockets. 50% Viscose, 50% Virgin Wool Model is 173cm/5'8 and wears a size IT 38. ‘Sparkle’ navy bouclé jacket from iconic German designer Karl Lagerfeld’s eponymous fashion label. Cut for a slightly cropped fit design to sit at the waist, the jacket is crafted from a textured lamé and wool blend with iridescent flecks. Comprising a round collar, gunmetal-toned zip fastening and long sleeves. Fully lined and complete with side slip pockets. 65% Polyester, 30% Acrylic, 5% Wool Model is 173cm/5'8 and wears a size IT 38. 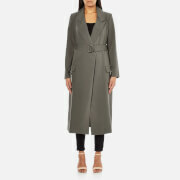 Women’s khaki duster coat from Lavish Alice. Cut from a premium woven grosgrain fabric with a fluid drape, the lightweight jacket comprises a notch lapel collar and wrap over design with a detachable D-ring belt fastening. Falling to a mid-calf length, the design is complete with cargo style pockets to the front and a split vent hem to the rear. 95% Polyester, 5% Elastane Model is 173cm/5'8 and wears a size UK 8. 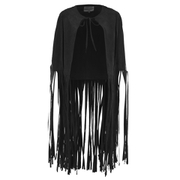 Women’s collarless blazer with cape detail from Lavish Alice. Cut from premium woven fabric, the tailored jacket features a collarless lapel and a cape overlay for a statement silhouette. 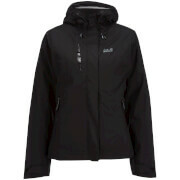 Subtle darts to the front and rear add a feminine shape and the style is complete with two jetted front pockets. 95% Polyester, 5% Elastane Model is 173cm/5'8 and wears a size UK 8. 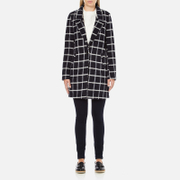 Women’s black and white wool coat with an all over Nordic-inspired check pattern from Maison Scotch. Crafted from a warm textured wool blend, the jacket is cut for a slightly shaped fit and fastened with a single button closure. Complete with angled front pockets, notched lapels and a bonded lining. 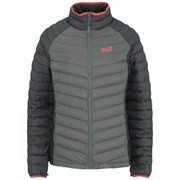 70% Polyester, 30% Wool Model is 175cm/5'9 and wears a size 1/UK 8.